This dinosaur was great for identifying several different shapes with the kids ~ triangles, rectangles, and ovals. When we sat down to put the craft together, the kids had to count out four rectangles, five triangles, and one oval so we were able to squeeze in a little math too! Depending on the colors of scales the kids pick out, you can also pattern the scales. 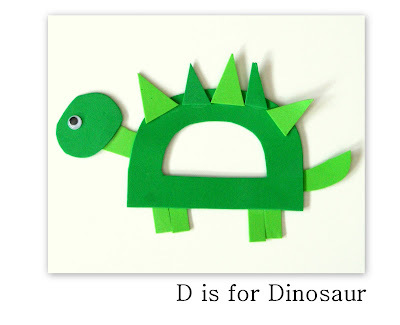 Trace and cut an uppercase 'D' out of the foam sheet or construction paper. I used a foam sheet that was about 4" x 5" in size. Using the extra foam, cut out several triangles for the dinosaurs back. Cut out four rectangles to use as 'legs', an oval for his head, a neck and a tail. Glue the legs, tail and neck onto the back of the letter 'D'. Flip the dinosaur over and add his head, scales and eye. I should try making some of these, my kids would probably love it. I just love your letter crafts - they are all truly designed for fast preparation and execution. Thanks for sharing them with us. I just found your blog. i love it! I love all of the great crafts and school organization ideas.